TOKYO -- Toyota Motor's operating profit climbed 10 percent in the latest quarter as windfall gains from favorable foreign exchange rates offset weakening business in the key U.S. market, where rising incentives and falling wholesale volume dented regional profitability. Citing the better exchange rate outlook, Japan's biggest automaker also lifted, for a second time, its earnings forecast for the current fiscal year ending March 31, 2018. Operating profit advanced to 522.2 billion yen ($4.64 billion) in the carmaker's fiscal second quarter ended Sept. 30. Net income increased 16 percent to 458.2 billion yen ($4.07 billion), Executive Vice President Osamu Nagata said Tuesday while announcing earnings results. Revenue increased 10 percent to 7.14 trillion yen ($63.45 billion). Global retail sales increased 3.5 percent to 2.63 million vehicles in the July-September period, including results from its Daihatsu small-car subsidiary and truck-making affiliate Hino. But worldwide wholesale volume, dipped 0.7 percent to 2.18 million. 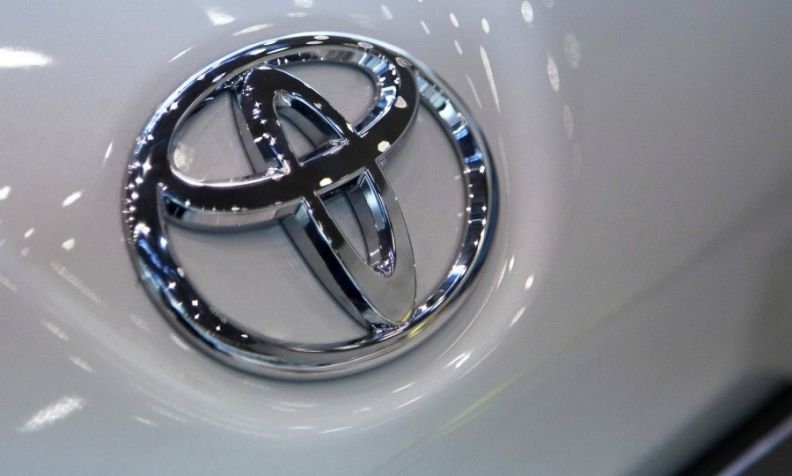 Foreign exchange rate gains boosted Toyota's second-quarter earnings. The Japanese yen's weakening against the U.S. dollar, euro and other currencies pumped up quarterly operating profit by 135.0 billion yen ($1.20 billion). But without the gain, operating profit would have fallen by 85.0 billion yen ($755.4 million). When excluding the foreign exchange rate boon, the decline in quarterly operating profit was due mainly to softening business in North America, Nagata said. "The worsening of the U.S. business is the biggest factor," he said. In the U.S., Toyota struggled with a flood of vehicles coming off lease, rising incentives and a rush of consumers away from passenger cars toward crossovers, SUVs and pickups. Toyota has been slow in reacting to the U.S. shift to light trucks. Industrywide, cars made up just 36 percent of total U.S. sales in the first nine months of the year. But at Toyota Motor Sales U.S.A., which covers sales of both the Toyota and Lexus brands, cars accounted for 42 percent of the mix. North American operating profit tumbled 60 percent to 55.3 billion yen ($491.4 million) in the July-September period. Toyota blamed increased marketing expenses and decreased production. Regional wholesale volume in North America slipped 1.8 percent to 672,000 vehicles in the fiscal second quarter, but North America kept its position as Toyota's biggest market. European operating profit declined 32 percent to 17.4 billion yen ($154.6 million). European wholesale shipments advanced 8 percent to 229,000 units in the three months. Toyota aims to rein in incentive spending, improve its management of leasing and pump up output of crossovers and pickups to bolster profitability going forward, Nagata said. The just-redesigned Camry sedan is helping Toyota reduce incentive spending, he said. The company is also trying to increase output of the RAV4, C-HR and Highlander crossovers and the Tacoma pickup, which are among Toyota's hottest-selling nameplates. "These are some of the initiative we are undertaking to improve performance," Nagata said. "In the second half, we hope that we can improve profitability." President Akio Toyoda warned in May that he felt a sense of crisis as the company braced for another year of falling profits in the current fiscal year ending March 31, 2018. But thanks to better-than-anticipated foreign exchange rates, Toyota upgraded its fiscal year outlook, for a second time. It now targets a narrow profit increase, instead of its previously predicted decline. Toyota now expects operating profit to rise to 2.00 trillion yen ($17.78 billion) in the current fiscal year, from 1.99 trillion yen ($17.68 billion) a year earlier. Net income is seen advancing to 1.95 trillion yen ($17.33 billion) from 1.83 trillion yen ($16.26 billion) the year before. Aggressive cost cutting and lower quality-related outlays will also help. Toyota also lifted its full fiscal year sales target. It now expects wholesale volume to drop just a hair to 8.95 million vehicles, from 8.97 million the year before. It had earlier said wholesale shipments would take a steeper drop to 8.9 million. Toyota raised its sales outlooks for Japan, North America and Europe. In North America, Toyota still expects wholesale shipments to decline in the current fiscal year to March 31, by 1.7 percent to 2.79 million vehicles, compare with the year before. But it had earlier forecast that North American sales would fall to 2.78 million units. Toyota lost its title as the world's biggest automaker to German rival Volkswagen Group in calendar year 2016, with worldwide retail volume inching ahead just 0.2 percent to 10.2 million vehicles. But that fell short of the 10.3 million vehicles VW reported selling for a 3.8 percent bump.